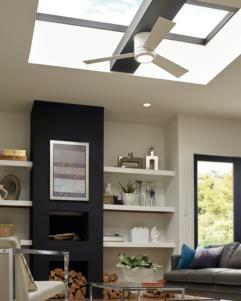 The Clarity Max ceiling fan by Monte Carlo is a larger and more powerful version of the popular Clarity fan. The 56” Clarity Max has a sleek, three-blade design that hugs the ceiling, making it ideal for rooms with low ceilings. It’s offered in three finish combinations to suite virtually any décor requirement. Damp-rated for indoor/outdoor use, the Clarity Max also comes with a four-speed wall control with LED dimmer.